Chemical weapons are the one type of unconventional weapon with which naval crews can cope. You wear lots of hats as a naval officer. Daily job, watchstanding, battle stations, miscellaneous collateral duties. One hat that adorned the Naval Diplomat's not-yet-balding pate was fire marshal, in charge of preparing the ship's repair parties to combat fires, flooding, battle damage … and attacks involving chemical, biological, or radiological (CBR), weapons. I later ended up teaching CBR defense, among other things, at a naval training command in dear old Newport. Good times were had by all, I assure you. Cheery subject matter does that for a class. One weird thing about this brand of warfare was the inconsistent vocabulary used to describe it. Various armed services, government agencies, and international bodies applied a variety of nomenclatures to unconventional arms. There was CBR, and CBRN, and NBC, you name it. One acronym I have never cared for is "WMD," shorthand for "weapons of mass destruction." Why? The fine folks at the Carnegie Endowment for International Peace, who publish the authoritative guide to Deadly Arsenals periodically, put it best when they issued the 2005 edition. The coauthors disavowed WMD because the term, though convenient, conflates very different types of weaponry entailing very different characteristics, effects, and moral implications. In particular, they fretted that merging chemical with biological with nuclear weapons in the public mind had distorted the debate over how to handle Saddam Hussein's unconventional arsenal. WMD implied nuclear for the untutored, demanding major military action to prevent an arms race in the Gulf region. But the suspected Iraqi mass-destruction arsenal was made up of chemical arms and perhaps biotoxins, whose properties resemble those of chemical agents. This was a threat of a lesser order. While Saddam hoped to resume his atomic quest at some point, it was a remote prospect a decade ago. Lesser instruments of war may have warranted lesser countermeasures. More precise language, argued the Carnegie team, begets more prudent deliberations. If so, disaggregating these munitions for analytical purposes helps restore precision to debates over nonproliferation and counterproliferation. Deadly Arsenals maintains that nuclear weapons are the only true weapons of mass destruction. I agree. Think about it. Teaching shipboard nuclear defense always elicited gallows humor from navy students. It demanded that mariners assume a lot: if you survive the blast, and the heat, and the electromagnetic pulse, and the initial radiation, and the radioactive fallout that accumulates on exposed surfaces, then you can take certain measures to recover and fight the ship. Well, OK, then. Biological weapons? Less mass-destructive, but more insidious. Biological agents are living organisms that have a nasty habit of spreading from host to host. They're the gift that keeps on giving. Plus, symptoms take time to manifest. Pestilence may have spread before anyone's aware an attack has occurred. Think the Black Death in medieval Europe and you get the idea. Detecting an attack, determining that it is an attack, and figuring out how to respond defies the medical expertise of crews on the scene. In my day, in fact, your shipmate was the best detector for a biological assault. He was the canary in the coal mine. You knew something was up when he started exhibiting symptoms or acting goofy. (Insert your favorite joke at the Naval Diplomat's expense here.) Classifying an agent often demands laboratory analysis, which says something about your capacity to take defensive measures and decontaminate affected surfaces. In short, timely countermeasures were elusive. 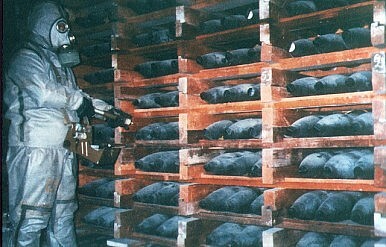 Chemical weapons were the one type of unconventional weapon with which crews could cope. Ships were outfitted with automatic detectors, albeit not terribly reliable ones. Various kits let repair parties classify an agent, remove it with some degree of effectiveness, and get back to the serious business of warfighting. Chemical arms, in short, were a routine part of the threat environment, no more worrisome than conventional hazards like land-based bomber raids, supersonic antiship missiles, or wake-homing torpedoes. You probably see where I'm going with this macabre trip down memory lane. Merging all unconventional weapons under one umbrella term like WMD may skew decision-making relating to the Syrian civil war or other contingencies involving chemical, biological, or nuclear arms — impelling Western governments to overreact, or underreact, diplomatically and militarily in times of crisis. Having been on the receiving end of antiship missiles and sea mines, it's not intuitively obvious to me that being gassed constitutes a worse way to die — and thus a more grievous offense to civilized sensibilities — than being blown up, incinerated, or drowned. In the 18th century, Dr. Johnson likened Royal Navy service to prison with the possibility of being drowned. Modern threats would have boggled even his expansive mind. I doubt gas attacks would have struck Johnson as uniquely grotesque. Biological and nuclear attacks may differ in nature from chemical use owing to the vast scale of nuclear destruction, or because both biological and nuclear arms have long-lasting effects — fallout from nuclear explosions, disease from infectious agents. Such differences are worth pondering carefully the next time our leaders consider sketching redlines, and thereby committing themselves to actions that may prove imprudent or do little to help the afflicted. Best to keep a free hand in times of strife.